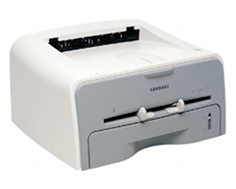 The Samsung ML-1755 was one of the smallest black and white laser printer on the market at its release. This printer featured printing performance and durability in a small, low-profile package that could be accommodated by even the smallest of work spaces. Samsung advertised this model as stylish and easily able to compliment and enhance any home or small office setting with quiet operation that would permit a user to continue concentrating on work while jobs ran. 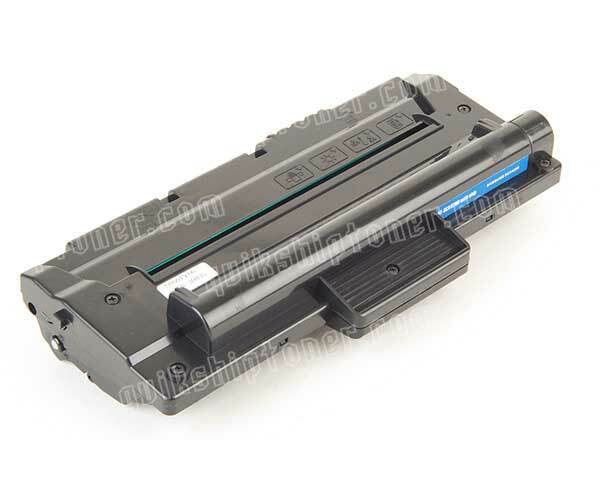 Other advertised features included material conservation functions designed to cut consumable costs by reducing toner usage and printing multiple documents on one page. Printer memory was increased to four times that of the ML-1750 and an optional Ethernet adapter became available, but all the other features of this printer were identical to that model. The Samsung ML-1755 could achieve print speeds of up to 17 pages per minute for black and white letter size output and 16 pages per minute for A4 size documents. A maximum print resolution of 1,200 x 600 dots per inch ensured quality printing of text documents that would be presentable to college professors and customers of small and home businesses. This compact machine was 13.7 inches wide, 14 inches deep and only 7.6 inches high and had a weight of 15.4 pounds, making the most of a low profile design that could be integrated into any work space or room. A built-in LED provided a basic means of displaying printer status in a way that increased efficiency and minimized down time, allowing a user to quickly diagnose normal issues such as an empty paper tray. Two connectivity interfaces came standard with this model, a USB port and a parallel port to accommodate a lot of the computers still in use at that time that were using IEEE 1284 parallel interface technology. USB had just barely become the standard for connection of peripherals. Installed fonts included 45 varieties of scalable, 9 types of TrueType and one bitmapped. Printer page RAM was expanded to 32 MB for this model, enabling this printer to handle heavier workloads for small and medium office jobs and expanding its capabilities beyond just home and personal use. Supported media types included plain paper, cards, envelopes, transparencies and labels. Media sizes up to 8.5 x 14 could be accommodated, as well as 5 different types of standard envelope sizes and 3 x 5 in. card stock and label sheets. A total media capacity of 250 sheets enabled the paper input tray to hold a half ream of paper without having to reload, providing 15 minutes of continuous print time at top speeds. The manual load bypass tray could accommodate straight-through printing of heavier card stocks and other special media types. The rated monthly duty cycle for this model was 15,000 sheets, targeted to personal home use, yet allowing for the slightly increased demands of small businesses and home offices. 250 Watts of power consumption while fully operational and 10 Watts of consumption while in standby/sleep mode made this model Energy Star compliant. An optional external Ethernet adapter could be purchased that would connect this printer to a home or office network, making the Samsung ML-1755 a shared resource across networks by utilizing the TCP/IP protocol to give this device its own address. The maximum print speed of 17 pages per minute was considered to be on the slower end at the time of this printer's release, with several models of ink jet printers being available at lower prices, offering faster speed and better quality output. People who still have this printer may find it difficult to configure with a Windows Vista or 7 system and full functionality is not guaranteed when connected to newer computers. Review it: "Samsung ML-1755 "
The Samsung ML-1755 came with a starter black toner cartridge with an average yield capacity of 1,000 pages. Replacements can be purchased that hold a capacity of approximately 3,000 pages. Both estimates are at a standard 5% page coverage. Average cartridge costs provide a cost-effective printing solution, with toner costs per page averaging one cent. 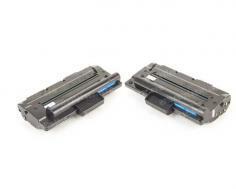 ML-1755 (ML1755) 2Pack of Toner Cartridges - 3,000 Pages Ea.